UPDATE...Lonnie won. I raised my glass to both Lonnie (because he won), and Joe (because I told him I would). Since no one got the answer right, I had to take the most creative. My completely subjective winner is Joe Vo with "Discount Japanese Flags - Irregulars and Factory 2nds." And the real answer figures into the prize. 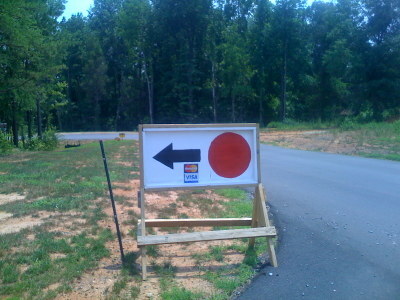 The real answer is "Hey y'all, there's an ABC store (state run liquor store) over here to the left that takes cards! WooHoo! South's gonna rise again" Or something like that. The prize? Tonight before bed, I will raise a small glass of Henry McKenna bourbon in honor of Joe, Kristin, and Emlyn Vo. Congratulations! Link: Oprah Winfrey recognized as part of Holy Trinity--now Quadhead -- Beliefnet.com. PLAY A TRICK ON SOMEONE TODAY!